The Doctor and Ace run across a deadly virus and it's creator. Will Ace and the Doctor find a cure and make it out alive? “Earth, 1990, a hospitable place for many species. None more out of sync with nature than human beings”, the Doctor, short wearing a panama hat and a question mark jumper and a brown coat, spoke to his companion, Ace, who was trotting along behind him in a forest. “Professor, what do you mean? I know exactly what nature is supposed to be like and how I’m supposed to experience it”, she replied as she fiddled with one of her many badges on her leather jacket. “You know, you don’t experience. That’s the problem with civilization. Always afraid to…”, the Doctor stopped talking as he noticed a body lying a few feet away. He ran over to it and noticed that the man was bright red. He looked as if severely sun burned, and had been decaying for weeks. Later, a police vehicle and an ambulance made their way into the lightly wooded forest and then next to the Doctor. The officer stepped out, nodded at the Doctor, and proceeded towards the body. The medical responders touched the body to put it on the stretcher, but one of them did not have gloves on. When he touched the body he turned the same shade of red as the corpse and died. He fell to the ground. His skin receded and shriveled in places similarly to the other body. About 2 miles from the crime scene, the Doctor, and Ace approached the house. After knocking about 7 times, the Doctor got out his new sonic screwdriver, and unlocked the door. “Just built this yesterday”, he smiled and flipped it in the air. As it rotated it blew up. The Doctor jumped back about 5 feet as it fell on the porch. Ace chuckled, and they entered the house. The Doctor bumped into Ace in the doorway. She looked back at him and he pushed her into one of the rooms. “You go that way, I’ll check this side”, the Doctor commanded. Ace rolled her eyes and went through a door to the other side of the house. The Doctor turned around to see a rocking chair and a fireplace with a full mantle. There was a picture with the man who was first found dead and another. He was taller than the other man, had short brown hair, wire framed glasses, and had blue eyes. Next to the picture there was a diploma. It read “Doctor Ludwig Humboldt”. “Breaking, and entering, I see”, a German accented man spoke from behind the Doctor. “Yes”, the Doctor mumbled slowly while still looking at the diploma which had revealed that this Dr. Humboldt studies Bacteria. “Well, why don’t you sit down? Both of you”, Humboldt spoke with a very humorous yet comfortable tone. Ace and the Doctor took seats on the couch next to the rocking chair, which didn’t seem to be there before do to its color blending into the wall. The Doctor had a skeptical look on his face and Ace looked generally confused. “So, Dr. Humboldt, what’s your current study?”, the Doctor inquired. “I am working on a special solution. If everything goes to plan, I shall have simultaneously created the cure for ageing skin, sunburn, and the brain tumor. It’s suppose to eventually become airborne. I put it into practice at a university in West Africa, but before I could finish, the students barged in and demanded revolution!! HaHAAA!! The director found out soon after and that’s how I lost my teaching license, hehe. Well, enough about… Archimedes!! Get out of there! !”, Humboldt yelled at a dove that landed on the ceiling fan. “And I’m Ace, his assistant and moderator”, Ace chimed in with a smile. She got a glance from the Doctor. He jumped up and ran around a corner that led downstairs. The two followed him. The Doctor still in his mood, and Ace kind of excited, reluctantly walked towards him. He pushed a button controller and music started to play. It sounded traditionally German. Ace dressed but the Doctor did not. The Doctor stepped up and around in tune to the music. “Du, duh, duh, dum, dumn, dumn, duuuu”, he started to hum. He stepped around swinging his umbrella. Ace complied and lay how the patient would when the cuffs locked around her. “Uhhh, Humboldt, is this supposed to happen?”, she yelled while she panicked. The table was behind a glass wall, with 1 door. The control panel sat against the glass, which was controlling the machinery. The Doctor noticed but pretended not to and kept on dancing. Then, the machinery holding a red substance in a glass syringe dropped down rather chunkily towards Ace. “Now, Doctor, you will tell me what you are after, or the girl will die”, he calmly spoke. The Doctor kept dancing and humming. “Now, Doctor!”, he said a bit louder. “Du, duh, duh, dum, dum, dumn, duuuu”, he repeated. Ludwig stepped towards the Doctor but it was a mistake as the Doctor tripped him, and ran towards the control panel. He pushed the same button as Ludwig did. It didn’t work. He tried the button beside it. The needle dropped slowly. He started to panic and pushed the next few. Ace then got impaled by the needle. “Doctor, you fool! !”, he got back up and punched the Doctor. He blacked out. The Doctor woke up in an ambulance next to Ace’s corpse. He disregarded it and sat up. The medic in the back with him was the one from the original scene. He was unconscious. He then touched Ace and did not die, or turn red due to him being a time-lord. He took a bone saw hung up on the side of the cabin and proceeded to cut the medic’s head open. His brain was visible. He then made Ace touch him. The brain decomposed almost instantly. There was still hope for Ace, though. He stepped out of the ambulance to find the same forest scene with the T.A.R.D.I.S. a few yards away. He dragged Ace there and called for another time-lord. A tree then appeared, and Rasilon stepped out. “What have you done? !”, he scolded the Doctor, who looked mildly depressed. “Last time I do you a favor”, he murmured as he dragged Ace into his T.A.R.D.I.S. The Doctor walked back to the ambulance. The front seat had the officer and the other medic in it. He strode back to Ludwig’s abode. Meanwhile on Gallifrey, The loom workers stripped what was left of Ace’s DNA. They took whatever was healthy and put it into the loom along with several dead time-lords. The loom went to work and created another being. He didn’t even resemble Ace. The new life was sent to the house of Lungbarrow, the Doctor’s old home. Back on Earth, in Ludwig’s lab, Dr. Humboldt started packing his equipment. His brown coat and hat hid him pretty well, but it wouldn’t matter because the Doctor appeared behind him. “What do you want? I didn’t mean to hurt anyone!! You didn’t call my bluff when Ace died!! The man in the woods, Donnie, came down during a breach without proper equipment!! I just don’t want to go to prison!! It was an accident! !”, he yelled and begged, see the Doctor’s pure furry in his eyes. “Sample, now”, he demanded calmly. “Here”, he babbled while taking a vile from his suitcase, his hand shaking. “Leave”, the Doctor commanded. Ludwig rushed out. The Doctor left, as well. He arrived at the area with his old ship and the ambulance. He entered the T.A.R.D.I.S. and made his way to the laboratory. He ran the substance through a filter and then through a polarity reverser that was left over from his banishment on Earth. He fled for the ambulance and rubbed a little bit of the powder on the medic’s forehead. The skin lightened slightly. It just showed to kill the virus, not bring back lives. The Doctor remembered the Ludwig said something about it being airborne. The Doctor released the powder into the air. It spread out fast. 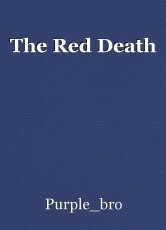 Hopefully, this would be the end of the Red Death. © Copyright 2019 Purple_bro. All rights reserved. The Thistlefall Chronicles: Volume Two: The Noble Child. Don't Forget 1 would be called Dont Forget but can't.